I was near a TV, and the 2005 version of Pride & Prejudice was on, which meant that I watched it. Amazing! And not in such a good way. I saw it in a theater when it came out five years ago, but was distracted by the problem of how very beautiful Keira Knightly is, and how having a drop-dead gorgeous Elizabeth Bennet utterly transforms the plot dynamic, since much of the charm of P&P resides in the fact that Mr. Darcy falls in love with her mind. Also, the movie itself is beautiful. The costumes, the houses, the landscapes all feel beautifully composed and yet slightly imperfect, like real life, except more so. I think on a large screen all this beauty kept me from noticing the stunning omission that was immediately apparent 4.5 years later on a tiny television: It is not at all funny. Pride & Prejudice. Not funny. How is that even possible? It’s not surprising to find a film version of P&P devoid of irony, since, like most literary devices, irony transfers poorly to film. And while the irony that suffuses P&P is perhaps the book’s most distinguishing feature, you don’t have to appreciate literary irony to recognize that P&P is also very funny. It’s witty, full of sparkling dialogue and hilarious exchanges that both move the action of the story forward and illuminate deeper themes of plot and character, as here in Chapter 10. As many before me have observed, P&P relies heavily on dialogue and is almost playlike in many places. What could be simpler than transforming it into a screenplay, as the makers of the 1995 version learned to their lasting delight? 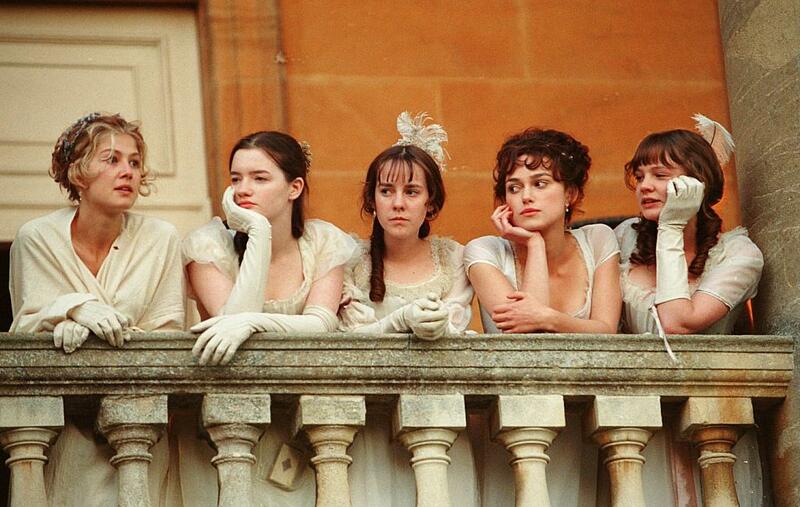 You stand back and let Jane Austen do the heavy lifting, sometimes adding a scene of someone bathing or fencing or jumping into a lake just to take a break from all the talking and dancing and gowns. This version did not. In the quest to keep the plot moving forward at a rapid clip, something had to go. Actually a lot of stuff did: Mr. Bingley was reduced to one sister, for instance, which had the effect of making the surviving one seem much friendlier with Mr. Darcy than she really had any right to be. Some of the funniest scenes in the book were brutally abbreviated, but even those that got their due (like Lady Catherine de Bourgh’s interrogation of Elizabeth at their first meeting) were, strangely, not funny. Once Darcy and Elizabeth’s most famous exchanges have lost their subtle restraint and their sophisticated syntax, the characters also seem to lose all respect for each other, and express their unacknowledged passion by bickering like fishwives. The only attempts at humor seemed of the stupidest slapstick variety, more Three’s Company than Marx Brothers, as in two separate instances near the end of the film when various members of the Bennet family listen at doors — to overhear Mr. Bingley’s proposal to Jane, and Lady Catherine de Bourgh’s interview with Elizabeth. Besides not being that funny, it seems a deliberate lowering of standards, for in Jane Austen’s world the only person crass enough to eavesdrop deliberately is the dreadful Anne Steele. Maybe a lowering of standards is the wrong way to put it. This is a Pride and Prejudice that seeks to shake the dust off a classic, as one reviewer put it. It attempts to make a nearly 200-year-old work seem up to date, and the way it does this is by making the people seem more like normal people today, who tend in the main to flatly state what they are feeling, lack a sense of irony, shout when they get angry, listen at doors. But the whole charm of Jane Austen 200 years on is that these people she writes of are not like us: they are recognizably human, in their emotions and their failings, yet they are also very different, in their acceptance of social restraints that would seem highly limiting to us, were we forced to abide by them. The tension between one’s true feelings and these social constrictions is the real problem in Jane Austen’s work, and the movie adapters who seek to update her work by having characters toss off the restraints so that only the feelings remain (as when poor Anne Elliot is made to run through the streets of Bath, hatless and panting, in the 2007 adaptation) do so at their peril, at the cost of a fundamental integrity.